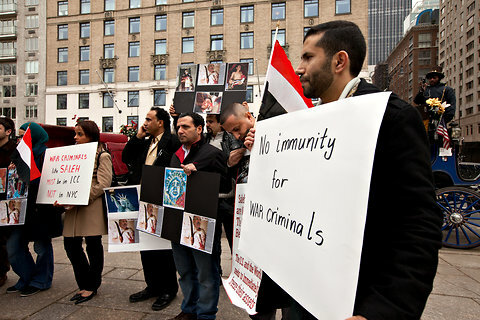 About 20 people gathered on Thursday outside the Ritz-Carlton in New York City—where the Yemeni President Ali Abdullah Saleh was said to be staying—to protest his trip to the United States for medical treatment and a deal he received that granted him immunity from prosecution for crimes against protesters during uprisings last year. Thousands of Bahrainis held a peaceful anti-government protest in a suburb of the capital on Friday, demanding the release of political prisoners and political reforms in the troubled Gulf Arab state. Protesters defied a heavy security presence across Syria on Friday to commemorate the 30th anniversary of a deadly crackdown on Islamist opposition in the city of Hama, but were effectively prevented from turning out in the capital, Damascus. Several thousand people rallied in Bratislava and seven other Slovakian cities Friday to demand that early elections planned in March be postponed to allow a thorough investigation. Poland’s prime minister says he is suspending the ratification process for an international copyright treaty after widespread protests and attacks on government websites. Members of an Indian tribe in Panama are blocking roads in two provinces on the border with Costa Rica in a dispute over mineral exploitation on their lands. Cambodian police violently dispersed a group of around 150 women protesting forced evictions in the capital Phnom Penh on Thursday. Around 300 people gathered outside Budapest’s New Theater on Wednesday to protest its new director, an actor with links to far-right parties.